Iowa Stars goaltender Mike Smith's mask is emblazoned with The Tragically Hip. 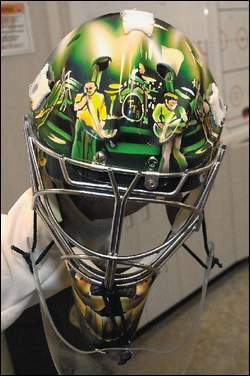 Here's a picture of his mask featuring The Hip in concert. Your Mike Smith Update: He's considered the frontrunner to back up Marty Turco now that John Hedberg has left, but will face competition in camp from Dan Ellis and Tobias Stephen.